The easiest guitar chords for beginners are the Em, C, G and D chord. But...I don't teach them in the typical way that most guitar teachers do. I find many guitar teachers try to teach beginner guitar students chords that are sometimes just too hard for the absolute beginner. So I use a step-by-step approach to learning guitar chords in an easier way. I will share with you how I go about teaching students their first four chords on guitar. Scroll down to bottom for video. The easiest guitar chords for beginners are listed below. 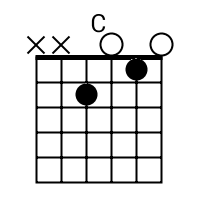 Why are these easy guitar chords? The three chords listed below only use two fingers, the 1st finger and the 2nd finger. The Em chord uses the 1st finger on the 5th string 2nd fret and the 2nd finger on the 4th string 2nd fret. To get to C from Em, all you have to do is leave the 2nd finger right where it is and move the 1st finger down to the 2nd string 1st fret. To get to G from Em, all you have to do is leave the 1st finger right where it is and move the 2nd finger up to the 6th string 3rd fret. The last will be the trickiest because you have to move both fingers, but, you will notice that they share a similar angle in that the 1st finger is lower an further back than the second finger. But you said you were going to teach me the four easiest chords?! The last chord is the D chord and you will learn the full version of that chord. You will need this chord to start playing some killers songs. But hopefully you have practice the first three chord enough that moving your fingers is much easier. I usually have my students practice the first three chords for 1-2 weeks before adding the D chord into the mix. The D chord is made by placing the 1st finger on the 3rd string 2nd fret and placing the 2nd finger on the 1st string 2nd fret. Last, you will place the 3rd finger on the 2nd string at the 3rd fret. This will be the toughest of your first chords, but keep working at it and it will come. By learning only these for chords, you have gained access to 1000s of songs that you can play along to.